Today, I got up, made potatoes and eggs, and crawled back into bed. I listened to Tapestry on CBC. The show called , "Wherever you go, there you are(n't)." Since I'd returned home to Canmore precisely one week ago from 16 months in Ontario I've been wondering, "How do I change based on where I live? How does my sense of place affect my happiness? My feeling of belonging or mattering?" The short answer, is not the where I am that matters so much as how my sense of self in space changes how open I am to noticing love. Being in love. When I notice my Place, I notice my Self. And when I hear my Self, I am more open to everyone and everything. I paced across an outdoor courtyard in downtown Calgary, a glassed-encased, office-tower warren of sidewalks holding back growling vehicles. Through my earbud, I sheltered my friend CC from the buzz. She was in Ontario. I in Alberta. We met in a virtual, warm salon of our own conjuring somewhere in space. Our conversation strung together tassels of everyday worries and activities into fringes of hope which trimmed our souls' longings and provide comfort. My commute home became a road less travelled when I took the old highway. Audio recording of mystic, Paulo Coelho's Brida bathed my ears and mind. Down the snowy road, wild ponies stepped onto the asphalt as if to say, "Proceed with Caution: there's wild in the domestic, and domestic in the wild". 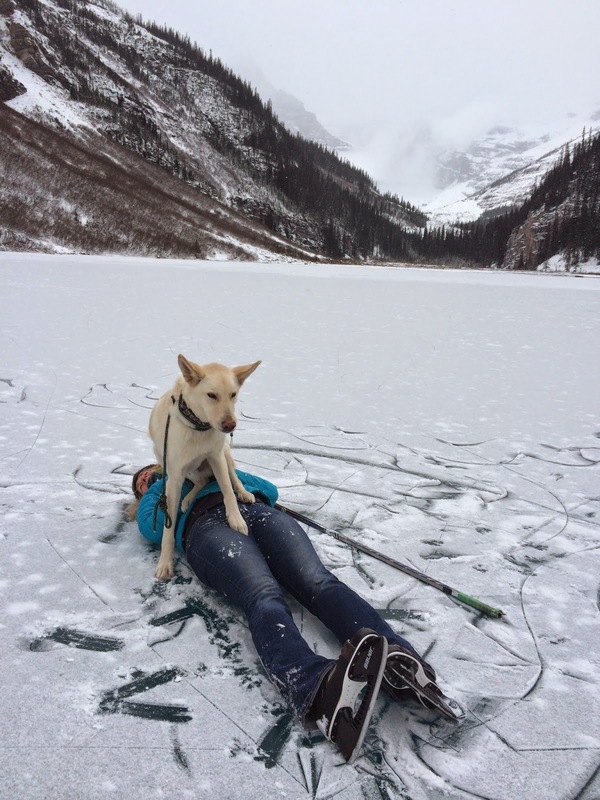 Yesterday, I skated on Lake Louise with my pal Sly, her son and her dog. That grounded me in the grey vastness that is the Rockies. Skating is my FAVOURITE winter sport and I smiled so hard my teeth got really cold and my crows feet etched more deeply. Later, I partied with friends at a cozy cafe who were all there to help me celebrate my return "home". My friend's band played great tunes. It all warmed me to my core. What is "home" exactly? Where the heart is? Not so simple as my heart is scattered in pieces throughout the globe. Or to borrow from John Donne, "Gold to airy thinness beat." The flakes of my love are pounded to a fine lustre which connects me to those I care about. The veil of connection stretched back in time and beyond death--thin, but sturdy and unbreakable. And then there was the dream that entered my sleep just after dawn today. Someone from my long-ago-past stepped in for a moment of comfort. He seemed so forlorn that the feeling lingers long after awakening like smoke from an extinguished candle. I am there with you. Always, there. A Facebook birthday greeting to a distant friend yielded the most incredibly rich reply. When he read my note he coincidentally was wearing the same fleece jacket he'd worn when we met nearly a decade ago. He wrote, "As I wear this same garment, I am a different person inside the same sleeves. Life experience has reminded me more of who I have always been inside from the moment I arrived on this planet. " That seems like a great ending to my blog and beginning to my day here "at home" in the mountains, prairies, foothills and rivers of my life. Answers arrived on the wings of a sweater, in the eyes of a pony, the smoke of dream, the breath of conversation, and the glide of a blade across ice. Wow. It was a good week.